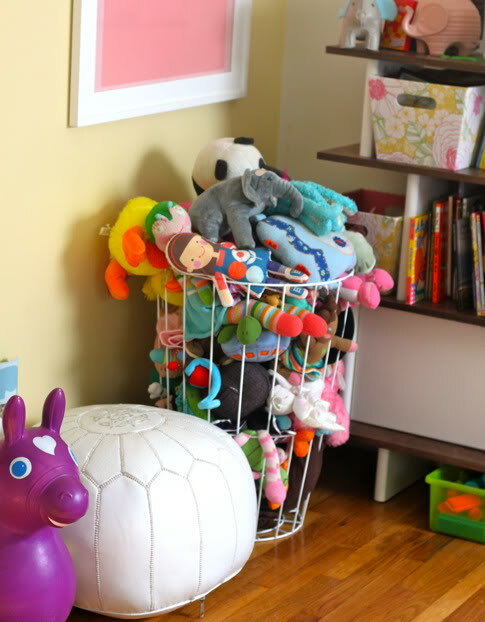 We Prudent Mamas have discussed toy storage over the years (check the Toy Storage: Nooks & Crannies post for how we roll in the Curtis household); it’s a first world problem for sure – where to put all these luxurious toys our tots are lucky enough to possess? I’ve found that as baby grows, the stuffed animal collection grows at a 10X rate. I had a little eureka moment when I spotted this laundry bin and it’s worked out so well, I thought I’d share. Give us your stuffed toy storage tips in the comments, and you might win some of that pom pom trim Jacinda’s been petting.
. Over at Babble’s Family Style, all of us editors contributed our favorite storage tips and put together a little slide show, check it out here: 12 Smart Ways to Declutter. I have had stuffed animal 'issues' for years now! I have asked for help/ideas from friends/family and to no avail (apparently no one else has stuffed animals coming out of their ears). I finally realized my husband (in his self proclaimed 'man-cave') had a BIG red plastic bin with two rope handles. Ding Ding. I took his stuff out and cleaned it…added stuffed animals and tada…instant animal issue solved! Love your idea with open sides to pull animals out because my children just dump them everywhere to find the one animal that just happens to be at the bottom. Great idea! My aunt just sent my daughter eight large stuffed animals. They take up her whole crib(!) so they're on the sofa and driving me crazy. I have an Ikea floor pillow from the children's section that are meant to be filled with an air pocket. Instead it's full of stuffed animals. The zipper is easy enough for my 5-yr old to open and she is pretty good about rotating her snuggle toys on her own. Plus it makes a really comfy seat! Good idea:) So…I'm a pretty mean mom..cause I just cleaned out all my daughter's stuffed animals and got rid of about half of them! I know…so terrible. Oh well…with the money I make from selling them…I can afford therapy someday for my daughter. Not mean. My dad burned a bunch of ours in the fireplace in front of us, permanently scarring my sister. Figuratively, of course. I thought it was pretty fun but I'm a jerk like that. We have a toy chest that is overfilled with stuff animals. I really need to sort through them all. It's not like my son even plays with them. I do like the wire hamper you use. It's cute. omg!! yesss. toddler princess macy has way tooo many stuffed animals and she loves them all…. ALLL. And they all live in the living room. On this cute little bench/toyholder. i want to put ribbons and a long cushion on it but there are toys sitting on it. So the wire bin is awessooomme. Wheres the thing from? I want it!!! Oh what a great idea! Love how its neat and tidy, but still very visible, because my girl needs to be able to see EVERYTHING all the time or she just isn't happy! We use an old CD rack for stuffies here. It's made of…what? Metal dowels? Thick wire?…similar to your laundry bin. The kids can pull the stuffies out the sides, and the whole thing is bolted to the wall, so it won't fall over. I LOVE it. OMG I ? that wire basket and it's perfect for stuffed animals – you can see them!! We have a huge basket and my daughter ends up throwing them all out to find what she is looking for! I'm so buying this basket!!! Thx!! I use a hanging mesh tube from Ikea. We did tie extra rope to the top hanger so it would be low enough for her to access. The bottom portion is used for my four year old's "babies" and the top couple of spaces I throw extra sheets for her bed. She plays with ALL of the animals almost daily. If only I could stop her from dragging her animals into our bedroom, my office, the living room, and the bathroom. *This morning I wallked into the bathroom to brush my teeth and 10 of her babies were sitting on the toliet. "Mommmmmy they're pooping. They poop with the door closed. Ok Mommmmmmmy, you can go now." Thanks for the great idea! Now, if someone could tell me where to find that awesome bookshelf pictured BEHIND the wire laundry bin…? Cute! When I was little my mom hung a little hammock in my room where I could reach my stuffed animals. Great idea, I use my little one's old bassinet for the job but it's starting to overflow, wire basket here I come. When I was a younger kid I had a "net" that was hung on the wall in a corner so it could hold my toys. It was put at a height that I could still reach plus it was pretty cute. I have a great one. You know those wire planter baskets? The ones you put the coconut liners in. There are ones that are only half a circle so you can attach them to the wall, and then put your stuffed animals in them and keep them off the floor. You can also paint them to match your decor. We have a great big tin bucket. It's amazing how many can shove into it. Nice cheap and effective solution. Being able to see the animals for easy access is always a bonus. Supplying the customers the information that they want will have them come back to your page again and again. (20), Nazem Kadri (18), James van Riemsdyk (18), Tyler Bozak (12) and Joffrey Lupul (11). Each cooling fan designs has its own unique characteristics in terms of efficiency, noise levels and application. Dental implants eliminate almost all problems associated with dentures. damaged during the placement stage of the procedure. the water the chicken was cooked in, which of course has been transformed into chicken broth. Cover and chill in refrigerator for at least 1 hour before serving. It. In older dogs it is probably one of the leading causes of death. stood inn front of my dog, without saying a word. Nice post. I ledarn something totally new and challenging on websites I stumbleupon everyday.